Place a message under the dog poo or attach it to the poo bag and leave it for the dog walker to see next time he/she passes by. Dog walkers, like their dogs, are creatures of habit and most repeatedly use the same route for exercising their dogs. Leaving a message means that they become aware that someone is keeping an eye on their round and has been found to be most effective. Don't forget to retrieve and dispose of the message after a few days and use whatever measures you see fit to avoid contact with the faeces. The poo fairy is a myth! 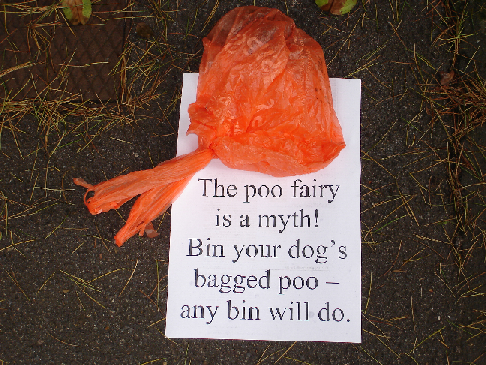 Bin your dog's bagged poo - any bin will do. Your ready-to-print copy is here. Shame on you! 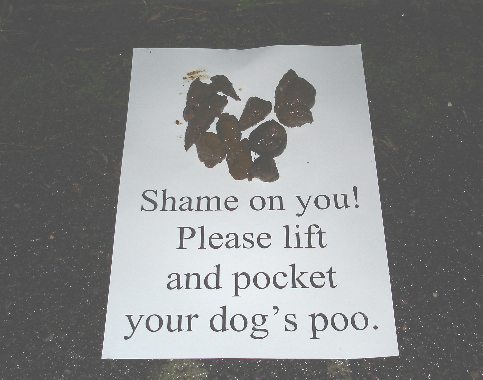 Please lift and pocket your dog's poo.